The Colorado Division of Motor Vehicles (DMV) announced that all Colorado driver’s licenses and identification cards issued after July 1, 2013, will have a gold star in the upper right-hand corner. The gold star helps to verify the authenticity of the cards by federal agencies when the ID is used for an “official purpose“. “Official purpose”, as defined by the Secretary of Homeland Security, includes presenting a state-issued driver’s license or ID card for boarding federally regulated commercial airline flights and entering restricted and semi-restricted federal buildings, military bases and nuclear power plants. If your Colorado driver’s license or ID card does not have a gold star in the top right-hand corner, because it was issued before July 1, 2013, you do not need to renew your card until it expires. Customers will be able to renew online or in a driver’s license office once their cards expire. Your new card will have a gold star on it. The gold star indicates that the card is compliant with increased security standards of the REAL ID Act of 2005, passed by Congress. All Colorado cards currently in circulation are REAL ID compliant. The REAL ID standards are being phased in over several years. DHS is implementing REAL ID through a period of phased enforcement over the next several years. In particular, the date for implementing the prohibition on boarding aircraft travel will be set after an evaluation of earlier phases and will not occur sooner than 2016. Update: See New Colorado Driver’s License Design, April 2016. Visit our website for Colorado Springs Mobile Notary services or Colorado Notary Training classes. Jerry Lucas is a Colorado Springs mobile notary public, state-approved Colorado Notary Training instructor, and freelance writer. He is the CEO of ABC Legal Docs, LLC and a former computer design engineer. Follow him on Twitter https://twitter.com/ABCLegalDocs and LinkedIn https://www.linkedin.com/in/jerrylucas123 Follow his blog for interesting and useful content on: Colorado Law, Colorado Notary Training, Colorado Springs Mobile Notary, Constitution, Court Cases, Federal Law, Foreign Language Documents, How to Articles, Legal Forms, Legal Terms, Notary History, Notary Information, Notary Laws, Notary Questions, Notary Terms. Blogging Tips, Holidays, Product Reviews, Security, Small Business Tips, Tech Tips, WordPress Tips. Can you think of a good reason why a Colorado Driver’s License with a gold star, issued in 2015, would not be an acceptable form of identification for a U.S. Citizen when applying for a Real ID Driver’s License upon relocating to another state? Can you think of a good reason why a person with a Real ID Driver’s License should have to submit proof of being in the U.S. legally, and documentation of name changes, when the Colorado Real ID Driver’s License contains the applicant’s Full Legal Name? A notary does not give legal advice or legal opinions. When applying for a driver’s license or ID from a government agency, the agency follows state or federal laws and rules. What does a hollow black star mean on the Colorado driver license? 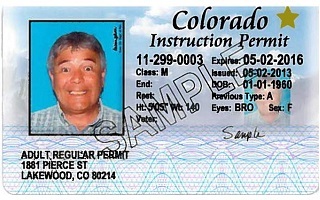 The Colorado driver license design was changed in 2016. On the old design, a gold star was used to show REAL ID compliance. On the new design, a hollow black star is now used. There is another blog post about the new design at New Colorado Drivers License Design. REAL ID allows the card to be used to enter federal buildings and for air travel. For more information from the Department of Homeland Security (DHS), see REAL ID Act on DHS.gov website.